Are you a SaaS product team struggling to turn visits to your website into trial users? Do visitors to your blog leave without giving you a chance to even offer them a free trial? In this case study, we’ll discover how Stays.net boosted monthly sales of their software 10% and turned nearly 38% of blog readers into subscribers. 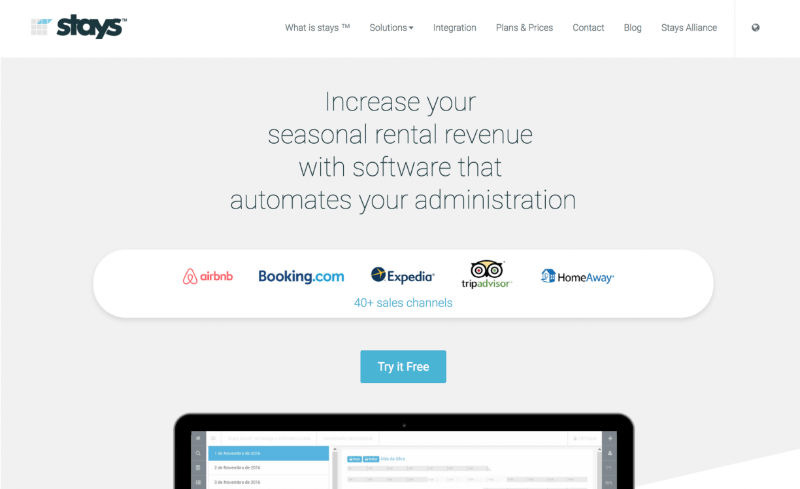 Stays.net is vacation rental software that helps seasonal properties more easily manage bookings. Mareorama Marketing is a digital marketing agency providing outsourced CMO services for growing businesses like Stays. Lucas Morello, owner at Mareorama and Head of Digital Marketing at Stays.net, shared with us how they’ve used OptinMonster to help their client increase monthly software sales 10%. Before using OptinMonster, Stays.net only converted 1% of blog visitors to their email list. Lucas knew they needed to improve, and started with the lowest-hanging fruit: capturing abandoning visitors. As many as 70% of visitors to a website will leave without taking any action. If you only have time to do ONE thing with OptinMonster today, it should be this: attempt to keep your abandoning visitors from leaving! After all, you can’t continue to educate and sell to a subscriber you don’t have. The lightbox optin below is triggered using our Exit-Intent technology and appears only when a visitor attempts to leave the site. For instance, when the visitor’s mouse motions towards the browser bar. That’s a clear signal they’re about to leave the site altogether. The reader is presented with two choices: I do not want or Yes I want. If they click the No choice, the optin simply closes. If they click the Yes choice, a form appears which allows them to subscribe to the Stays.net newsletter. Campaigns that require the visitor to first click Yes or No typically convert better than campaigns showing the optin form right away. That’s because once the visitor clicks the Yes option, they have already committed in their mind to finishing the subscription to get the thing they want. The optin above converts 37.21% of abandoning visitors. Those are great results, for sure, but Lucas didn’t start out with results like that. He got there by split-testing his offers using OptinMonster’s easy A/B testing feature. A split test (or A/B test) is a test that marketers run to compare two different versions of a web page or popup to find out which one converts visitors the best. The campaign below was the original offer and converted only 11.47% of visitors. 11.47% is still a great conversion rate, but the copy in the winning campaign states more clearly the benefit of subscribing (increasing holiday bookings) and so converts much better than the original. If Lucas had not split-tested this campaign, he would have lost out on an additional 26% conversions! Even when you think you have a winning campaign, don’t be afraid to test it against different versions. Here are 14 ideas for split-testing your campaigns that could make a huge difference. After his success growing the Stays.net email list, Lucas moved on to attempting to convert visitors into trial subscribers. Using our MonsterLinks feature, Lucas placed call-to-action buttons throughout the website, inviting visitors to begin a free trial. MonsterLinks are buttons, links or images that launch a lightbox campaign when clicked. The same principle that helps Yes/No campaigns convert well is at play here, too. Once a visitor takes the initial action to click the “Try It Free” button, they’re more likely to complete that action than a visitor who didn’t initiate it. These MonsterLinks convert an outstanding 39.74% of visitors who click the buttons into trial users. Stays.net isn’t the only OptinMonster customer to increase free trials using MonsterLinks. Bulkly increased free trials 134% using MonsterLinks. Given their highly specialized niche, traffic to the Stays.net website was already quite targeted. Small improvements in conversions from that traffic equaled big changes in sales. 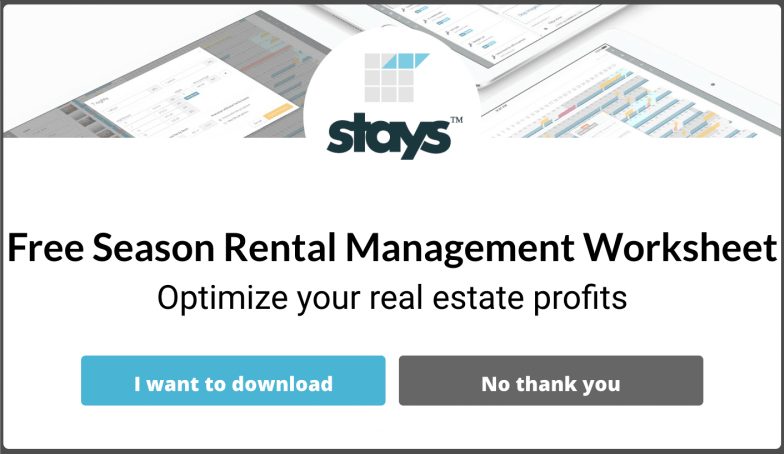 Stays.net captured 37.21% of abandoning visitors. 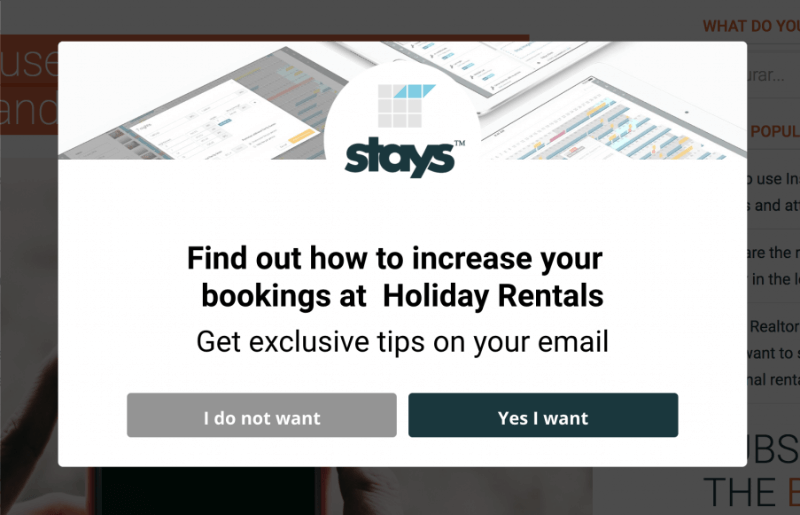 Stays.net increased conversions by 26% using split-testing. Stays.net increased monthly sales a whopping 10% as a result. Stays.net had only two goals for using OptinMonster. They needed to increase conversions on the blog and to increase free trial users. By offering multiple calls-to-action, and capturing abandoning visitors, they were able to easily do both. Before OptinMonster, the conversion rate on the Stays.net blog was 1%. Using OptinMonster, we improved it to 6%. We were constantly improving by A/B testing and trying different types of popups. As a result, the conversion rate on the blog is now around 10%. Today, we are able to grow our sales 10% a month with the leads generated by OptinMonster popups.